This post is a short summary of the 40 minutes video course content in my email marketing course. This strategy will help you create the email lifecycle of your brand. Basically, the flow your users will go through from signup to unsubscribe. Each campaign has a clear goal in your strategy. It is important to define these goals before you implement your strategy in your Email Service Provider (ESP). Otherwise, you’ll see yourself going back and forth and potentially working more than needed on the campaign. For each campaign, I included a tip on how to define your goal. You can also see some broadcast signs in this lifecycle. I already share my view in this email blast post. Note that I excluded from this lifecycle any transactional emails like forgot password or purchase confirmation. Let’s take a look at each campaign. Probably the most important email you’ll send to your new users. It’s the first contact with your subscriber’s inbox. What do you want them to do or take away from this email? For example. 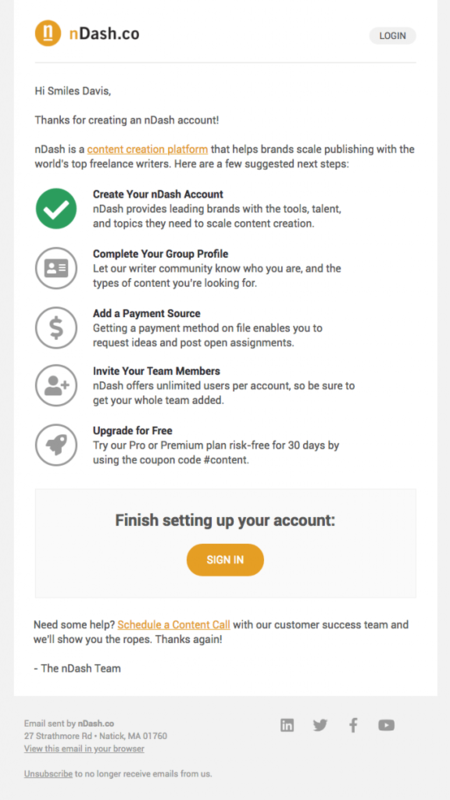 nDash wants to make sure the users finish the set up of their account and shows them the remaining steps. 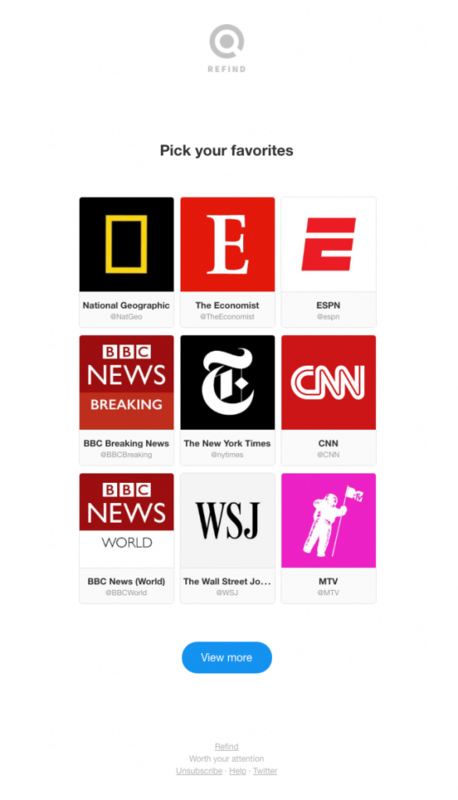 In this other example, Refind wants to know which media is the user’s favorite. To send better content in the next part of the lifecycle: engagement. Note that onboarding can be one or more email. Again, it depends on your goal. Revolut has a great onboarding email series where they keep sending an email as long as you don’t order the credit card. Most of the emails you’ll send will be part of an engagement campaign. The goal is to make your subscribers engage with your product. Engagement can take a lot of different forms based on what you are selling. Basically, you want to stay top of mind for your users. Ask yourself: what can I send to my users that will be useful for them and offer a way back to my product? 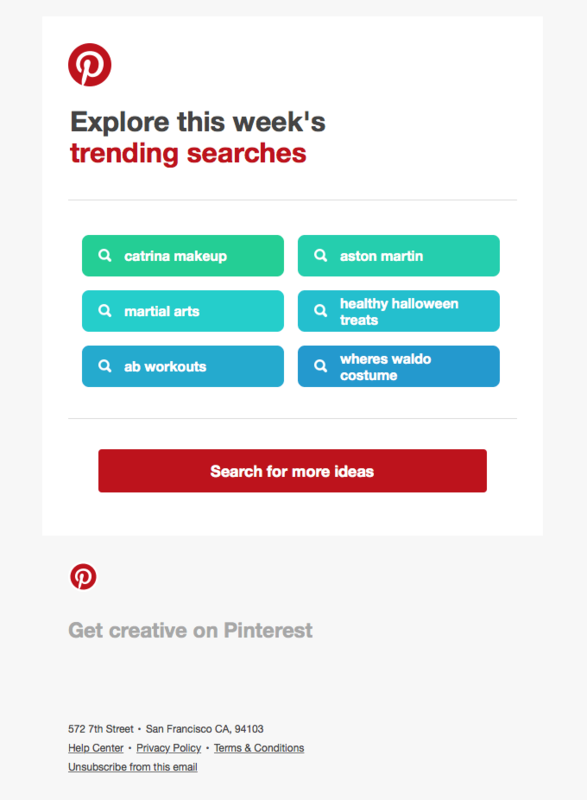 Pinterest, in the example below, is showing popular searches that could be interesting to you. It’s a way to show what’s going in the product and bring you back to see the results of these searches. Below, Airbnb is offering solutions on what to do during a trip. You have an upcoming trip either because you booked on Airbnb or you searched for these dates. So here are some activities or experiences you can book for this trip. Note that if you only have one product or a seasonal one, this campaign can be short. It doesn’t need to last for years. Winback campaigns are used when engagement doesn’t work anymore. The goal is to bring your users back in the engagement campaign. Asana is telling you than their product is now faster and you should try it. Reelgood is playing the what’s new in your product card with this one. Use the sunset campaign only if you care about your subscribers. And your email quality score. Sunset campaign is a way to segment your most inactive customers out of your sending list. They won’t be unsubscribed so you can still email them. But at least they won’t impact negatively any other metric. Paul Mitchell asks one more time if they want to receive emails from them. Sunset campaign should be no more than 2 or 3 emails. One to prepare the last sunset email, which could ask for some feedback. And the one to sunset the user. When you implement this. You’ll have the most effective email marketing strategy out there. Let me know if you have any questions about it or want to see how it could work for your product.